There aren't many articles when we search on the Internet about KhmerOCR topic, I, myself don't find a lot as well. Of course, I believe that there are some people or companies might quietly in implementing the solution for that but without any announce I believe my presume below are relevant enough for people to understand about current situation of Khmer OCR. I could find that, there are about several Khmer OCR researches being published through some organization, website and universities. When we talk about Khmer OCR, we suppose around the solutions to make any characters from scanned images of handwritten, typewritten or printed text converts into machine-encoded text. I might miss some others but here are what I could find about what have done so far with this topic. If you, guys, have know some more, please share to people through comment form. I will check and update. 2005, The Khmer Printed Character Recognition Using Wavelet Descriptors by Chey Chanoeurn et al got the accuracy of 92.85%, 91.66% and 89.27% on 10 types of Khmer fonts in 3 different sizes. 2008, The Khmer Segmentation for font Limon S1, size 22 by Ing Leng Ieng, PAN Localization Project got the accuracy of 99.11%. 2009, The Khmer OCR for Limon R1 Size 22 by Ing Leng Ieng from PAN Localization Project using framing and Discrete Cosine Transform calculation for recognition based on Hidden Markov Model and got the accuracy of 98.88%. 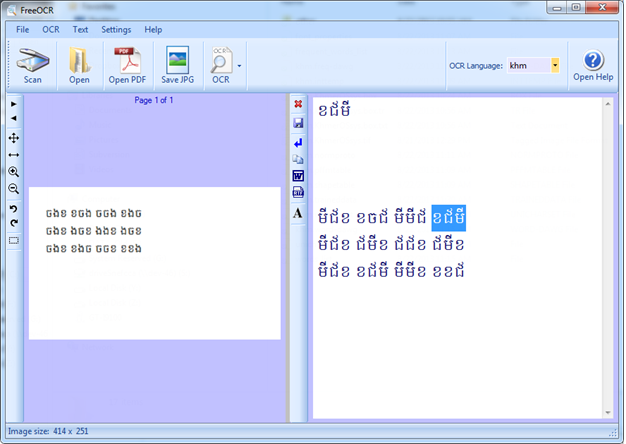 2011, The Khmer Optical Character Recognition (OCR) by Mr. Kruy Vanna using Fourier Descriptors, Component’s Holes, and Component’s Location got accuracy of 97.9% on 19 types of Khmer font. The research No. 7, I did it and it's submitted at Royal University of Phnom Penh (RUPP). So it's not publicly publish any where yet. Royal University of Phnom Penh (RUPP) also doing some more researches on this matter through students' researches, thesis and with their lecturers. One opensource OCR engine, Tesseract OCR, it's a completed engine from the image processing to recognition and its output. What we need for our Khmer language works for it, we need to analyze "how to train" our dataset. I also did some training for Khmer as well for Tesseract for some letters, it seems that the system is good to go but there are some thing we need to aware before as I posted a question here. I will try to write a post on how to train some characters that I did before. Why Tesseract at this time? Previous researches are mostly using their own combination of methods to solve various issue for Khmer language such as in segmentation or recognition but the pre-processing process (image processing) is also important for a real OCR system and its accuracy. And I could see that Tesseract OCR is ready for all of that. Is There Anyone Already Try for Tesseract? Yes, you can search on Google, it has already been trying since 2009 per my search on Google and around. And it might be already made by some universities or lecturers but remaining unclear for me. So, Is There Any Ready Tesseract OCR for Khmer? My presumed answer: No, I've never heard that there's a ready training set for Khmer yet to use in Tesseract OCR Engine. But, just today, I checked again at the repo of Tesseract (14 January 2014), I saw some Khmer config is added (Files: Khmer.unicharset, Khmer.xheights), we need to test if they are working. Therefore, Students, Lecturers, some NGO or community should take part to help this. The OCR system is very interesting for people nowadays. We are using Khmer Unicode since it established in 2003 in the Kingdom and with Unicode, we have Google translate recently. Then, Khmer OCR should be also solved somehow as well. We need more people to do it, to help, to share and publish. If any mistake in above research, please alert me in comment. Nice to read your blog here! Do you know if anyone has released Khmer OCR software besides PAN Cambodia (which only works with Limon R1)? As I know, until now no yet. But there are some people/NGO is doing it now, just we don't know when it will finish or successful enough. It is a shame that the PAN software was not opensource. It actually works quite well with Limon R1. But it seems they have discontinued development. Hi, are you publish source code in any public site, like GitHub or something? I would like to take a look and contribute. Remember the source code is under GNU, so all your change will be derived from the same GNU as well. Are you working with Danh Hong at all? He actually has a working Tesseract OCR system ready to deploy for Khmer that auto trains for new words/fonts. It will be up on the web in a few weeks. Not working with him, he has his team. My side are with universities to plan for any improvement and on forming a team to make the opensource/open data for future development/research. I can't comment much now, will see the result. And hope Danh Hong joins us to share his idea. I hope you get in contact with him. It is such a waste to do the work twice. If you need his contact information I have it. I am helping with the hosting of the website that will do online OCR for Khmer - the offline version works, they are just working to get it working on the website. If we all collaborate it will be much faster. Yes, we had contacted him already; hope he will join us. Từ lâu nay, dịch vụ order hàng nhật đang và đã được nhiều khách hàng sử dụng. Với độ tin cậy, chi phí thấp được sự ung hộ và giới thiệu của rất nhiều khách hàng. Cùng nhau mua sắm với fado - mua hàng trên amazon ship về việt nam , từng bừng trong những ngày tết. Ngoài ra chúng tôi còn nhận mua hộ hàng nhật Và mua hàng trên web nhật gửi về Việt Nam với chi phí thấp. Hy vọng dịch vụ chuyển đồ từ nhật về việt nam sẽ được nhiều người yêu thích.